The History of Jiu-Jitsu on the island of Kaua’i, Hawai’i "How it all started". In 1991, the first Gracie/Brazilian Jiu-jitsu class on Kauai started in Haena, on the north shore of the island. I had some videos with some vale-tudo fights from Rio de Janeiro and after showing to the locals and a few grappling matches later, I convinced them it was time to learn some Gracie Jiu-jitsu. At that time there was no UFC, it was up to us to introduce Gracie Jiu-Jitsu to the world. My first students were Kai Garcia, Carl Ragasa, Lyon Hamilton, Chris Kaamoana and a few more. All surfers. Classes started getting full in the garage, so Carl and I decided to rent this house in Princeville with a spacious two car garage that became a dojo. The mats stayed down all the time and we could train 7 days a week. We went on to our first tournament on Oahu, I was a purple belt and defeated by submission 3 of Relson’s best students at the time, taking the gold in the absolute division. Kai Garcia, Lyon Hamilton and Carl Ragasa , all as blue belts. fought hard matches. Kai's first match ever was against Egan Enoe, Lyon brought a silver medal, and Carl lost his first match. The classes moved to Matt Milbrand’s house in Kilauea and became even bigger. And thats when we named it Longman Jiu-Jitsu. The name was given after my nick name in Brazil, ”cumprido” is means "longman" in portuguese. In 1993, My friend Andre”vara”Derizans was on oahu living at Relson Gracie’s house, and he called me and said Rickson Gracie was coming to teach a seminar. "And you better come"! Of course I came and stayed at Relson’s house with Andre, his family, Relson, Rickson, Rockson, and a few other guys. I was twenty years old and I knew from then on that I had to keep learning Gracie Jiu-Jitsu straight from the Gracies, the ones who developed the art. After going to Brazil and training at the Gracie Humaita academy with Royler, Rolker and Robin, I knew that was where I belonged. It was a long learning experience, many tournaments and hard training days, under the Gracie Humaita Academy, till I got my Black belt under Royler Gracie. It was all worth it. The History of Jiu-Jitsu (continued). The History of Jiu-Jitsu is one of the oldest forms of martial arts known to man. It is said to have originated over 2,000 years ago by Buddhist monks from northern India, a few miles north of Bernares, where a man, known today as Buddha, the "Enlightened One," lived a peaceful life. The monks who followed the Buddha’s teachings wandered the countryside divulging Buddhism. In these journeys, they were often robbed and murdered. In response to this, they created a system of fighting techniques designed to defend themselves against their oppressors and attackers. Because it was against their religious principals to harm others, they developed a system without the use of any weapons and violent techniques. These grappling techniques came to Japan between the late 17th and mid-19th century. The method of unarmed grappling and self-defense came to Japan and evolved to what is known today as jujutsu or jiu-jitsu. The term jiu-jitsu is translated as "art of gentleness." This "art of gentleness" was practiced and perfected by the Japanese over centuries, kept hidden from other nations. In the 1800s, the Japanese opened their ports and began commerce with the English and other nations. The foreigners visiting Japan were amazed with jiu-jitsu, which to the foreigners was a new strategy of fighting. It was a fighting style where weaker and smaller were capable of defeating bigger and stronger opponents. Jiu-jitsu continued to flourish and develop, helping give birth to many other styles of martial arts, including judo - an art developed by Jigoro Kano (1860-1938). Brazilian Jiu-Jitsu was born in the early 1900s in the same manner. It was planted in fertile ground in a family of Scottish immigrants. In 1914, Mitsyuo Maeda (1878-1941), a man representing the Japanese government, arrived in the city of Pará, Brazil. He befriended the Gracie family, particularly the family’s patriarch, Gastão Gracie. Gastão was a "Carioca" (person from Rio de Janeiro) and a descendant of Scottish immigrants. He had eight children: Carlos, Gastão, Osvaldo, Jorge, Lika, Helena, Mary, and Hélio Gracie. Gastão Gracie helped Maeda, also known as "Conde Koma", prosper in his business in Belém. 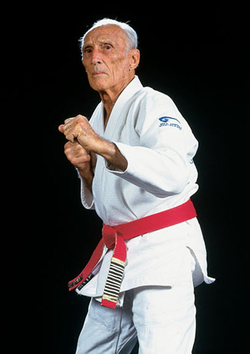 To show his gratitude, Maeda taught Carlos Gracie, Gastão’s eldest son, the techniques of Japanese jiu-jitsu. Carlos, in turn, passed along those teachings to his brothers. 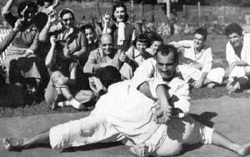 Carlos Gracie soon relocated to Rio de Janeiro, and there he began to teach jiu-jitsu. Just as it was taught to him, Carlos passed along the techniques and principles of jiu-jitsu to all of his brothers -- most notably, to the smallest of his brothers, Hélio Gracie. Hélio was, as a child, small and physically frail. Kept away from physical activity at a doctor’s recommendation, Hélio spent years limited to only watching Carlos and his brothers teach and train. One day when Hélio was 16 years old, a student arrived for class and Carlos was nowhere to be found. Helio, who had memorized the words and techniques of his older brother, offered to start the class. Soon after the class ended, Carlos arrived and apologized for his delay. The student answered, "No problem. I enjoyed the class with Hélio very much and if you don't mind, I'd like to continue with him." Carlos agreed and it was then that Hélio became an instructor. Hélio soon realized that some of the techniques he had memorized from watching Carlos teach were difficult, owing to his small size and lack of strength, for him to execute. It was at this time that Hélio began to adapt those moves to his frail body's abilities, improving the leverage in the execution of some of those techniques. Daring to break away from the traditional Japanese style, he began experimenting, modifying and perfecting simple techniques that would be effective regardless of stature. Many of the traditional facets of the art that depended on physical prowess and strength were removed and replaced with flowing techniques. Through trial and error, techniques were modified and perfected, emphasizing efficient technique and strategy over brute strength and force. It was through this process that Gracie Jiu-Jitsu (or Brazilian Jiu-Jitsu) was born. Hélio and his brothers continued to modify and perfect the techniques of Brazilian Jiu-Jitsu through years of training and countless challenges matches. The Gracies would take on all comers, of any size and from any art, in order to perfect the art. For seventy years, represented by the family champions (including Hélio, Carlson, Rolls and Rickson), the family remained undefeated and in doing so, left an indelible mark on the world of martial arts and fighting. In more recent times, through events such as the Ultimate Fighting Championships, Pride Fighting Championships, K-1 Mixed Martial Arts, Deep, Abu Dhabi Submission Wrestling Championships and the Campeonato Mundial de Jiu-Jitsu, the Gracie family and other representatives of Brazilian Jiu-Jitsu continue to prove the devastating effectiveness of this beautifully efficient art. Today, this tradition of flawless technique is carried on by Hélio’s sons - Rorion, Relson, Rickson, Rolker, Royler, Royce and Robin - as well as thousands across the world. Fighters and teachers, men, women and children alike use the principles of Brazilian Jiu-Jitsu for a myriad of purposes, including self-defense, fitness, sportive combat, and professional vale-tudo ("everything goes") fighting. gracies.